Oh, how I love (a few things) from Rubber Stamping to Paper Crafting to my Friends and Team to Card Making and to Learning a New Technique... so combine all of my loves (besides my family and reading) into one hand-crafted project! This fun new Bokeh technique is all the rage. It is supposed to mimic the light rays/bubbles in photographs and looks so cool. While being easy and fun it is way messy - lol. So get prepared to ink up those fingers when you do this cool new technique for a WOW hand-stamped card. Thanks to the help of my Color Coach - it paired the Soft Sky with Rich Razzleberry. 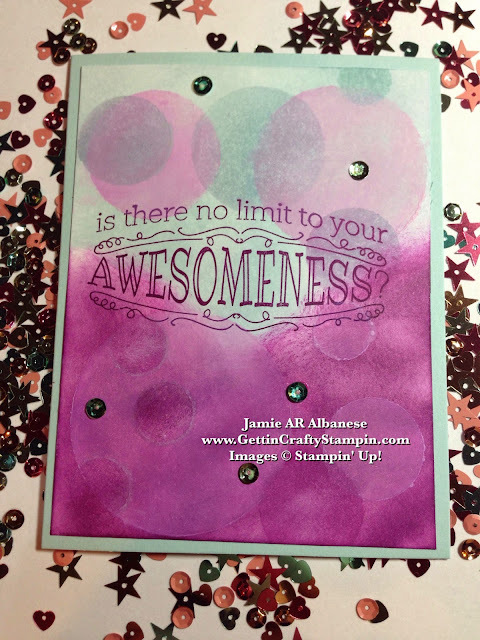 This helps to design a WOW hand-stamped card that is stylish in color. I introduced this technique in a Sneak Peak to my Gettin' Crafty Stampin' Stampers Newsletter last week. It is such fun to see how different you can make this project. You, too, can be part of this newsletter and see the exclusive tutorials, discounts and more - for FREE! Start by Sponging the Whisper White card stock (4"x 5-1/4") with the Soft Sky ink and the Rich Razzleberry ink in a fun pattern. 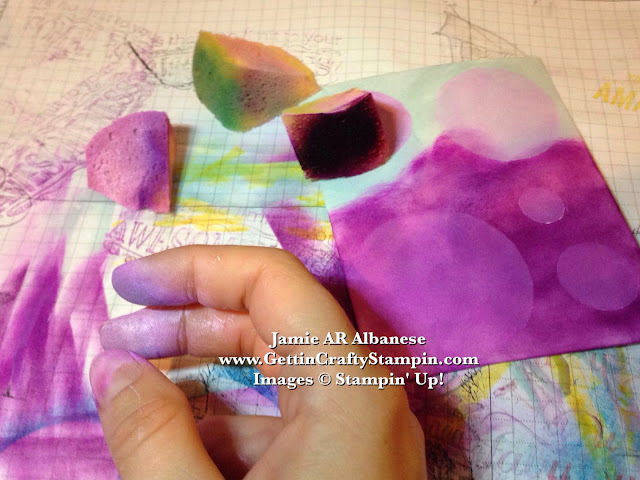 Keep each sponge with their stamp pad - to avoid mixing the colors on the ink pad. At our recent Team Meeting (the Last Saturday afternoon of each month it even includes dinner) we created awesome hand-stamped cards, had awards, door prizes, tutorials, ideas, fun and crafting - whew - we even did swaps of cards as a bonus fun accent to the meeting! I couldn't resist going an extra fun mile to deliver a WOW hand-stamped card that told my dear friends how very AWESOME they are!! I would love to have YOU Join My Gettin' Crafty Stampin' Team - it's a great deal and 9 years ago last week I signed up to get the discount and have been blessed with so very much more. This technique is allllll about the layers and random look. So see how it started out and as each layer is added, moving the stencil around to find the 'perfect' look/spot. I started out using the Whisper White Craft Ink Pad to create the base 'pale' bubbles. It did pick up the colors sponged on the base. I would recommend allowing the first sponged base to dry for a while before adding the Whisper White craft ink. See the bottom first box above. It soooo needs more, more interest and contrast. 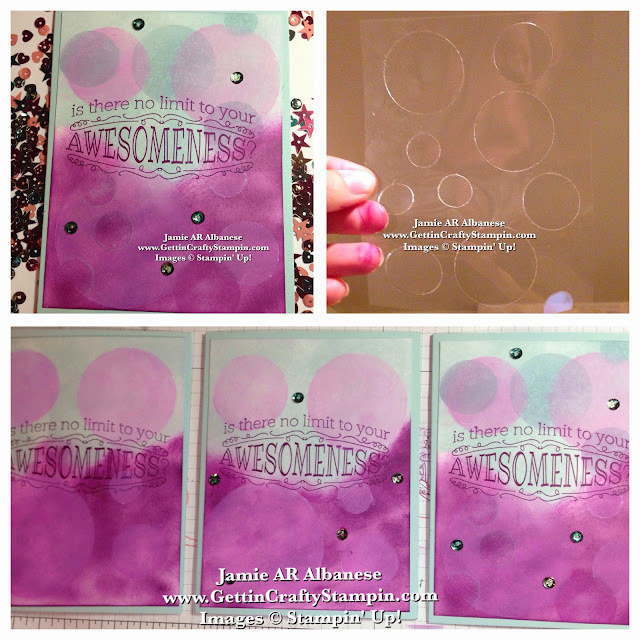 Using a the template in the Soft Sky ink pad to crate a new layer of bubbles overlapping the Whisper White ones. Stamping the sentiment from the Big News stamp set in Rich Razzleberry ink so highlight how awesome My Gettin' Crafty Stampin' Team is! Add more interest using the Multipurpose Liquid Adhesive and the 2013-15 Sequin Assortment to add sparkle. I did warn you - lol. Yes, you will get MESSY! Sometimes it is worth getting messy to create a dynamic hand-crafted card, isn't it? In creating this hand-crafted card for My Amazing Gettin' Crafty Stampin' Team and collection of dear friends it had to scream how AWESOME they are! So have fun and learn a new technique in paper-crafting. It is fun to try something new. Deliver an On-Trend hand-stamped card that will be proudly displayed. A small measure of love that can have bless in a big way - Join Me in delivering and blessing smiles to others this year! !